A FRIEND IN A MISERY. I started with my driving experience by working as a driver of the ambulance-car. In this two-yeared lifetime. the accidents effect and consequences. This had definitely influenced me to drive more carefully and sensibly. I say it was my first experience with transporting the animals which took two years. As a credit to the job I have at the moment I see my experience and practice with working in my own car repair service in past. It basically means I can fix the car on the road if there is no serious damage. I can do the engine overhaul for example. After eight years of having the car repair service I turned to a nice and with a man unexpected job. My second daughter was born and I started with the maternity leave instead of my wife. I do the animal transport since that. Of course it was just occasionally at the beginning (according to my maternal programme) but at the moment it is a proper job! ARE YOU SATISFIED? - TELL EVERYBODY ARE YOU NOT? - SAY IT TO ME! If you travelled with me and you will fill the form bellow you are going to get 2, 5% off for your next journey with us. I agree with my comment may be shown on this webpage. I will get your asks and references by an e-mail and I will try to answer them. Thanks for the confidence you gave my. Best regards. Brona Sup. * If you don´t fill these information schedules it will be quit complicated for me to answer. EXHIBITED - COMPETED - WON! of agro techniques and farm animals held on 25 - 28. 06. 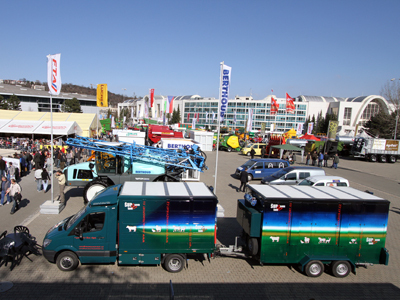 2009, at Brno Trade Fairs (BVV Veletrhy Brno, a.s.). This transport set is unique in the whole European Union. There were also two competitions in the title ?the best showpiece of the exhibition". 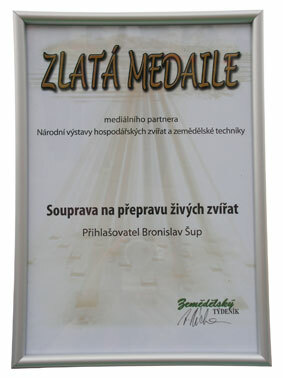 The first was given by Trade Fairs Brno (BVV Veletrhy Brno, a.s) and the other was given by the Agro magazine (Zemědělský týdeník). In both cases this set was awarded as absolutely the best in these categories. It received both golden medals. For me as an exhibitor it was the first exhibition ever. It was quite a responsibility and challenge to get everything ready in time. My original aim when entering the competition was to become more known among the professional and secular public. I really didn´t mean to win the golden medals - I only wanted compare myself with the competition from abroad. It was a great honour for me to be awarded by the official promoter of the event and the main medial partner of the exhibition. the customers I´m going to work with. From now on you can try and find out about the quality of the transport set and later agree with the authorities who gave me the award. Now when it is over I would like to thank to all of the partners who cooperate and team-up with me to reach this success together. Once more - thank you all! Let´s have another good time together. S radostí jsem přijal pozvání na jednu z největších výstav v ČR. Brno Trade Fairs Fairs (BVV Veletrhy Brno, a.s.). Congratulations and thank you for taking part at Agro fairs and National exhibition of agro techniques and farm animals. 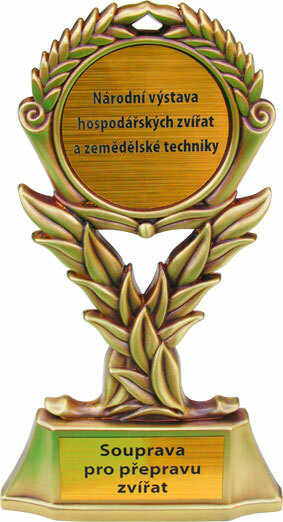 Congratulations for the gold medal at Agro fairs and National exhibition of agro techniques and farm animals. Zaměření: Konference je zaměřena na aktuální otázky ochrany a welfare hospodářských zvířat, zvířat v zájmových chovech, volně žijících zvířat včetně zvířat v zoologických zahradách a pokusných zvířat. Konference s mezinárodní účastí byla uspořádána Fakultou veterinární hygieny a ekologie Veterinární a farmaceutické univerzity v Brně poprvé 5. října 1994. Konference vznikla z podnětu tehdejšího pracovníka Státní veterinární správy ČR MVDr. Jiřího Douska a z pokynu tehdejšího děkana Fakulty veterinární hygieny a ekologie Doc. MVDr. Vladimíra Večerka, CSc. Tím byla založena tradice každoročního setkávání českých i zahraničních odborníků z řad pracovníků státních orgánů ochrany zvířat, veterinární a chovatelské praxe, univerzit a dalších vzdělávacích institucí, výzkumných ústavů, nevládních neziskových organizací a dalších zájemců o danou problematiku. Od počátku byla významným spolupořadatelem konference Ústřední komise pro ochranu zvířat, od roku 1999 je konference pořádána také ve spolupráci se Státní veterinární správou ČR. Organizátorem konference je nyní Ústav veřejného veterinárního lékařství a toxikologie Fakulty veterinární hygieny a ekologie VFU Brno. Put the cursor on the green node is the moment you have an answer to your posts. Pavel Čechovsky - Horse Taxi. Dear Mr.Sup, I finally reached your website today. I really like it. Once more I would like to thank you for the professional attitude and care while transporting my horse from Hnanice to Znojmo. I thing I had a quite lucky hand picking you as the transporter. Me and my horse are not going to travel anywhere at the moment but if we will we will ask you. Thank you very much. I wish you had a good luck on the road and with the customers. Regards. This is my way to thank for the transport of a young and inexperienced horse in a way he had no negative experience during the journey. Mr.Sup transported the horse on its own and without my help with the most of reliability. So the SupSemSupTam is well proved! Dear Mr.Sup, I´d like to thank you again for transporting our four pets: a mare Blanka, only a month-and-a-half! Old foal Zofka, donkey stallion Jura and the sheep Ester. Thank you especially for driving so carefully and for your thoughtful way. Personally I´m quite grateful for bringing us here to the lonesome wild countryside. It´s probably not a standard to drive through the fields. Thanks again and see you soon next times with SupSemSupTam! Michel Foster, Nedvězí u Semil. Dear Brona Sup, I´m happy that I finally found a person that fits my conception of a good and professional horse transporter. Finally there´s someone who has a complete documentation for export and import of horses in the CZ and knows all about it - someone who save my time and money! Thanks for professionalism, patience and cooperation. SupSemSupTam best to recommend to everybody. Pavel Ziegler, Slavkov u Brna. Dear Mr.Sup, you transported for us a herd of sheep from Brno to Caslav. On the way back you took one naughty ram. We would like to thank you for the best service and for you personally - as you are nice and friendly person. We will keep recommending you! Hello, I would really like to thank Mr. Sup for the time flexibility while transporting us. I was very satisfied. Hello, I´m going to repeat myself but I would really like to thank you again. The journey was unexpected - we had to hurry up to the vet´s clinic. Though Mr.Sup came as quickly as possible and made my horse´s suffering shorter. Thank you, also for him. Dear Brona Sup, I would like to thank you for transporting my stubborn fjord-hucul mixed pony and for respecting his character - I was the most stressed out one - not the horse! I´m looking forward to travel with you again in April because I´m sure it is going to be all right! Hello, I´m adding my references a little late. Last year we did a long journey with Bronislav and my horse from Moravia to Krkonose Mountains. I have to say the horse was relaxed and all right because Mr. Sup was driving carefully and made a good preparation. My horse is ok with entering the trailer since that. Thanks again for a super-trip and we wish you lots of happy kilometres with no troubles in future. .
Hana Vítová , Dvůr Králové nad Labem . Dear Mr.Sup. I did like your web pages but the transport itself was far better than my expectations. I really appreciate your professionalism, patience and flexibility in time that was very helpful while transporting our young mare at night. Thanks and we´re looking forward for the next journey. Hello, I would like to thank to Mr.Sup for a professional attitude at transporting my horse. I can recommend his service to everybody. No trouble. Šárka Knotová, Lužná u Rakovníka. After a longer time - but I have to say a big thanks to this transporter for his above standard services. He transported for us nine big ostriches from 300km destination with no stress. Everything was all right and he is very nice and kind!. Thanks and I´m sending another customer to you... see you soon. Romana Formánková, FOX-MEN s.r.o. , Hamr na Jezeře. Hello, I didn´t use transport with Brona for the first and either for the last time! He is driving carefully and he is an animal lover which is something you will appreciate for sure. I wish to him lots of satisfied customers and kilometres without accidents! Petra Ondrová a Dantes, Brno. Hello, we don´t have our own vehicle to transport our horses. 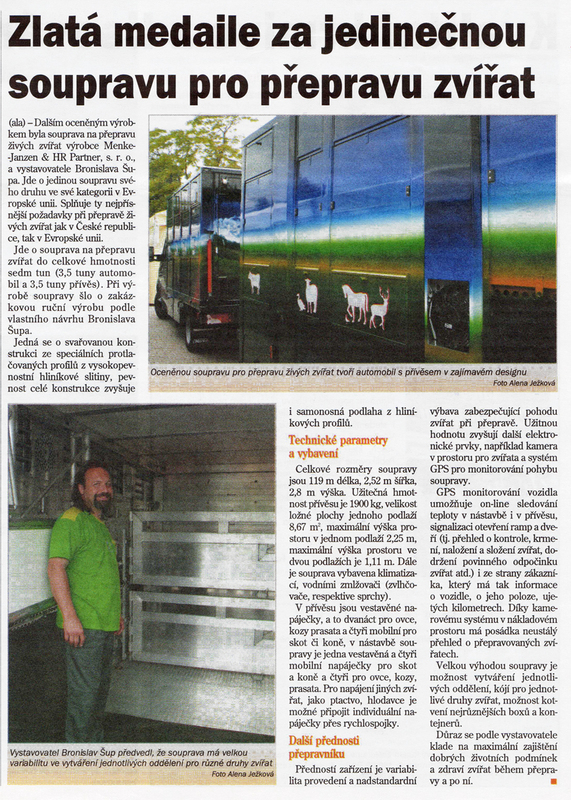 On one hand we need to invest the money in other things and on the other hand there´s a lot of good animal transporters in our country. Mr.Sup is one of the supreme ones for sure. He apparently loves animals and horses and he has a long time experience. He transports all horses with love and care they deserve... Beyond that, he is a nice person with whom you can speak easily almost about anything during the journey. And as a bonus he is actually not so expensive! It is worth seeing his web pages and photo gallery. Thanks a lot... me, my mare Sally who got used to us and a mare Bara who finally has a new friend and teacher. The journey was really nice. Elen Štolfová , Jaroslavice u Znojma. Hello, this is my way to say thank you to Mr.Sup who did a professional transport of Shetland ponies from Great Britain for us. The horses had the best care for the whole time of the transport. The journeys we will need to do the next season will be with him again. We are looking forward to bring new horses next times. 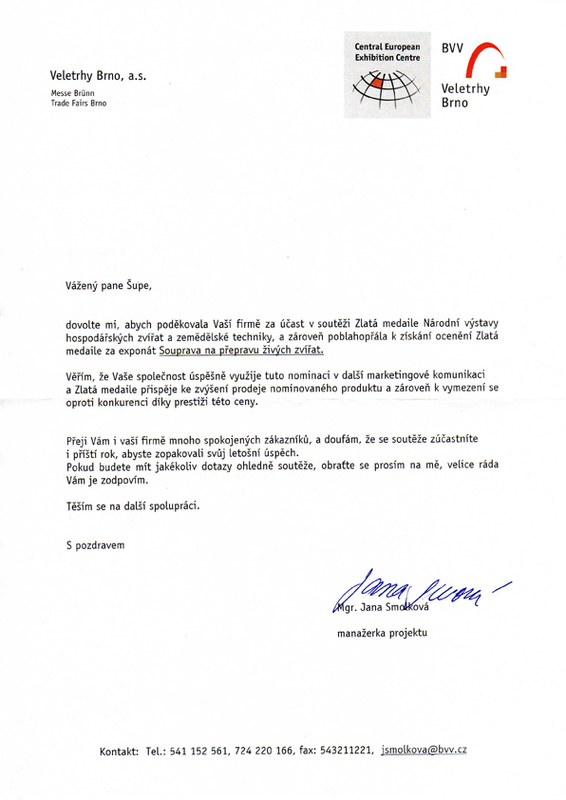 Renata Marková, Hřebčín Markes , Rosice u Brna . Hello, we use service of Mr.Sup regularly to transport pigs and we are always satisfied. Mr.Sup is a professional, his documents and stuff are always all right, and he is reliable and unusually for these days a nice gentleman. His vehicles are far behind the standard as well as the technical equipment. If you are looking for a reliable and professional transporter for your animals, Mr.Sup is the right one. We recommend him! Jana Krupicová , TOPIGS CZ, s.r.o. , Brno . Děkuji vám ze přepravu. Přeprava proběhla rychle a profesionálně. Doporučím vás dál. Lena Truchlá , Mokrá . dobry den, nozaj sa vam chcem podakovat za prepravu mojich koni, boli ste skveli. mozem vrelo odporucit vsetkym co vahaju, toto je najlepsi vyber. aj sa mi zda ze chybate lojzovi a amelke, tak snad sa o par rokov znova uvidime. Přeprava mojí kobylky firmou Šup sem šup tam, byla bez chyby. Přistavený vozík byl neskutečně čistý a vybavený kamerovým a větracím systémem. Přepravce se snažil najít co nejkratší cestu a vrátil mi peníze, které jsem zaplatil předem navíc. Kobylka nebyla po 400 km dlouhé cestě unavená a dorazila na místo v pořádku. Nemusela jsem ji na cestě doprovázet. Pan Šup měl sebou dokonce vodu a pamlsky a ke koni se choval velmi ohleduplně. Věděl si rady i s nakládáním problematické kobylky. Vřele doporučuji služby pana Šupa každému, komu na jeho koni záleží nebo nemá čas se o koníka sám postarat.